Happy Happy Halloween! This post has literally nothing to do with Halloween, but I figured I'd acknowledge it anyway. I hope your day is full of candy, costumes, and creepy stuff. Okay, so shopping for this month. I actually had not bought anything until a few days ago when I saw that Old Navy was having an extra 20% off of sale items. I'm trying to buy more quality items these days, and Old Navy doesn't really fit that bill, but the prices were so low that I couldn't pass them up. I also recently discovered that they sell items in "tall," which may or may not have changed my life. I kept exclaiming to Eric that I couldn't believe how long the shirts were! For someone that can usually barely tuck her shirttails in, that's a big deal. This shirt is originally around $25 and I got it for $9.58. The material is thick, so I think it will be perfect for the fall. And it's a great work shirt in a pretty color, so I'm sure I'll wear it a lot. So I actually only bought this tank ($5.58) to get free shipping (ON ships free on orders over $50), but I really like it. It got great reviews and since I am obsessed with sleeveless button-downs I figured it was a good addition to my collection. This shirt is actually what tempted me to put in an order... I have been looking for a dark colored chambray for a while. 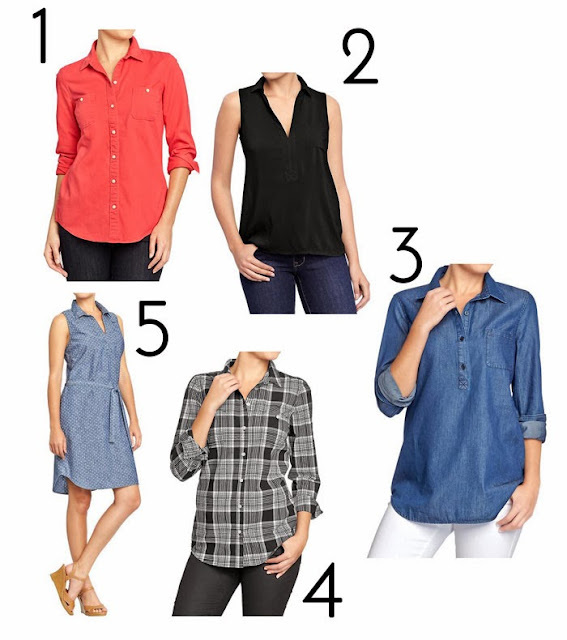 I have a light colored chambray that I wear all the time (also from Old Navy), so this gives me more options. Oh, and I got it for $11.18. The "tall" size is basically a tunic, which makes me so stinking excited because that just never happens. What can I say about plaid? It just screams fall to me. I have two other plaid shirts (a navy and a reddish pink) and while I normally don't like to have multiples of items, they all look really different. Oh and this shirt is LONG enough for me (can you tell I am really excited about this whole "tall" size thing?). I got it for $10. This is the only item that wasn't available in "tall," but it still fits really well. I paid $18.38, which I feel pretty good about since I think it will work in all seasons. It has a summer-y vibe, but it will work well with tights and a cardigan. I love number 3 and 4! So versatile! so jealous of the deals you scored! i really need to start going to Old Navy. LOVE #4! Cute! Some great pieces for fall! I love that plaid shirt! I've been buying ON tall sizes but just for bottoms. I have this weird thing where my torso is really short but my arms are really long, so I kinda just have to resign to rolling all my sleeves. i have been eying that coral button-down from old navy! i actually love old navy, so much of my clothing comes from there and it always holds up. i love their button-downs and they have some really pretty blouses right now, too. Actually, my favorite plaid shirt is from Old Navy and I swear it's the most comfortable I own. I've found that some of their stuff can be really nice. It's just hit or miss. Great picks though! You are so good at keeping your budget under control. Please teach me, oh wise one! My budget post will be up soon - hopefully tonight. Hope you had a good Halloween! Wow, great job for under $60! I really love the color of that first button up! I like the chambray pullover. How tall are you? Or do you just have a long torso? I'm tall and have long limbs so I always need tall or long in my bottoms and for my arms. Hey Ashley! Love how you like to stay around $50, which is about what I have to play with. Some months I "invest" more, but reading your blog helps keep me in check. :) Now I just need to figure out how my fellow bloggers put the "fancy" pics of the clothing you purchased up on your blog. lol. Then I can share my finds too. Oh man I am going to hop on this tall train right now! I didn't realize all of Old Navy's pieces came with that option (at least online). I also have a problem with the shirt tails thing too or finding tunics that actually hit me where tunics are supposed to. You scored such good deals with this latest round of shopping! What great deals! You got some really nice staples and pieces for layering!